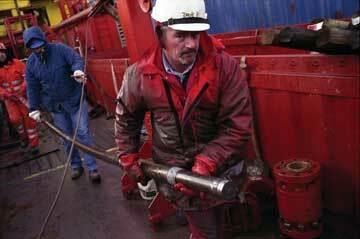 In 2004, the Arctic Coring Expedition team took three ships to the Arctic to drill a core near the Lomonosov Ridge. The team’s results are teaching us more than we ever knew about the past 65 million years in the Arctic. Over the past 65 million years, throughout the Cenozoic, Earth’s climate system has experienced both rapid and gradual changes. During this long-term climate change, the planet has gone from a “greenhouse world” with no ice caps, glaciers or sea ice — when even the Arctic was green — to today’s “icehouse world” of glacial and interglacial cycles, with frozen poles. Climate is primarily driven by regular and predictable changes to Earth’s orbit, and secondarily by long-term tectonic rearrangements of the continents, yet an explanation for the shift from the warm to the cold world is not yet known. What is clear is that the polar regions are critical cogs in the climate wheel, so they must have played a role in the switch from the “greenhouse” to “icehouse” world in the past, and may again play a central role in future large-scale shifts. For example, Earth’s albedo (the percent of solar radiation reflected back into the atmosphere) can be a major climate feedback component. Because the ice-covered poles have the highest albedo of any other locale on the planet, major changes in this ice can “tip” the planet to a cooler or hotter place. Today, we are witnesses to such a shift — the Arctic’s permanent sea ice is rapidly melting. Greenhouse-icehouse transitions take millions of years, yet the long-term cooling trend can be punctuated with extreme climate events. For example, the Paleocene-Eocene Thermal Maximum (the “Big Heat”) — a period of less than a million years around 55 million years ago, when the climate heated up in one of the most rapid and extreme climate events in the geologic record — has been studied with the sole purpose of advancing our knowledge of how the Earth climate system responds to large atmospheric, oceanographic or external perturbations such as may be occurring today. Both the gradual paleoclimate evolution and the extreme events like the Big Heat are recorded in archives located around the globe in various proxies, such as ocean and lake sediments, ice sheets, caves and coral reefs. Because Earth is currently undergoing an unprecedented climate warming, understanding the planet’s long-term climate trends and its response to past extreme climatic events has become increasingly important. In 2001, in a paper in Science, James Zachos of the University of California at Santa Cruz and colleagues reviewed the current state of knowledge of Cenozoic climate in a landmark paper. Zachos and colleagues assembled the then-known extreme events and integrated them with a compilation of oxygen and carbon isotopic data from equatorial and mid-latitude regions that describes the long-term changes throughout the Cenozoic. This review formed the framework upon which scientists have based much of their recent Cenozoic paleoceanographic research. Since 2001, researchers have added much more to the knowledge bank of the climate over the past 65 million years. They have discovered new extreme events, collected additional data that better constrained the size and timing of other extreme events, and developed and employed new techniques for paleoclimate reconstructions. Much more has also been learned about the little-known Oligocene epoch. And most significantly, in 2004, our crew recovered the first Cenozoic-long climate record from the Arctic Ocean during the Arctic Coring Expedition (ACEX). In just the past few years, the ACEX record has had an extraordinary impact on how we view significant parts of the Cenozoic, building new understandings beyond the framework laid down by Zachos and colleagues. 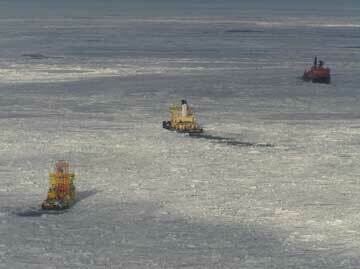 Drilling the Arctic is no easy feat: It involves icebreaking ships, strong drills and a steady ice surface. In one of the most fascinating studies using ACEX core materials, Appy Sluijs of Utrecht University in the Netherlands and colleagues reported in Nature in 2006 that just prior to the “Big Heat”, or Paleocene-Eocene Thermal Maximum or PETM as it is often called, 55 million years ago, the surface waters of the Arctic Ocean were as warm as 18 degrees Celsius (see Geotimes, August 2006). To put this temperature in perspective, the average sea surface temperature in the Arctic Ocean today is negative 2 degrees Celsius. Then, during the PETM, one of the few time periods in the geological record in which temperatures increased rapidly, Arctic temperatures soared to 24 degrees Celsius, more than 10 degrees Celsius higher than what current climate models predict is possible. These climate models cannot replicate these temperatures either, even when extreme levels of carbon dioxide are assumed to have occurred. This finding left us scratching our heads for other mechanisms. In a 2007 paper in Nature, however, Ryan Sriver and Matt Huber of Purdue University in Indiana suggest an answer to the puzzle: Ocean mixing by hurricanes could have been the mechanism that efficiently moved heat from the equator northward, keeping the Arctic seas warm during the period. Though this mechanism is under debate, it is an intriguing possibility that warrants further investigation. Looking at a younger portion of the ACEX record, Henk Brinkhuis of Utrecht University and colleagues found a time period when the Arctic’s environment was like nothing that had ever been conceived, as they reported in Nature in 2006. About 49 million years ago, when sea temperatures had cooled to around 10 degrees Celsius, the Arctic surface was primarily freshwater, and a freshwater fern called Azolla thrived. This means that the Arctic harbored a very intense hydrological cycle at the time, which is in stark contrast to today’s polar desert environment. No models had predicted that such an active hydrological cycle had occurred in the past, nor that one could occur again. That it clearly did occur, however, makes one wonder if it could happen again. 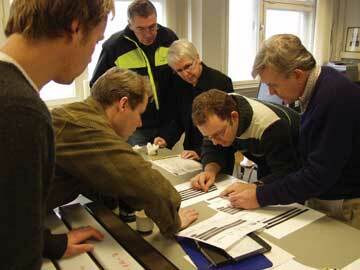 Members of the Arctic Coring Expedition team pore over the core they drilled. Even younger than this time period, at approximately 46 million years ago, ice-rafted debris was found in the ACEX record, as Moran and colleagues reported in Nature in 2006. This interpretation has since been replicated with more detailed analyses. Ice-rafted debris indicates that there was at least seasonal sea ice in the Arctic by 46 million years ago. This discovery of very early ice was startling because it means ice was present more than 30 million years earlier than previously thought. The finding, in combination with records from the Antarctic, suggests that the Cenozoic cooling trend occurred synchronously at both poles, in stark contrast to earlier interpretations that depicted Antarctic cooling first, followed many, many of millions of years later by Northern Hemisphere glaciation. Such a find also indicates that the same processes that cooled the Antarctic cooled the Arctic, which is a somewhat new understanding. The tail-end of the ACEX record also held more surprises with evidence for permanent sea ice cover in the Arctic Ocean over the past 13 million to 14 million years. The ACEX results have also spawned other cross-disciplinary studies that help to explain the complex response of the planet to extreme climate events. And the recently released Intergovernmental Panel on Climate Change Fourth Assessment from Working Group I, the Physical Science Basis, used results from several of these studies to clarify the extreme climatic warming during the PETM. These results show that the warming of the Arctic during this Big Heat was higher than that predicted using the global climate models. As researchers continue to examine the ACEX core, we continue to learn more about the past environment in the Arctic. Further studies from ACEX will soon be published in a special volume of Paleoceanography. A few new highlights include the ice-rafted debris results from ACEX that confirm that the Northern Hemisphere cooling began about 40 million years earlier than previous studies reported and suggests that the modern Arctic sea-ice circulation that is dominated by the Transpolar Drift and Beaufort Gyre has been active throughout this time interval. Other researchers have conducted detailed analyses of the ice-rafted debris and found that a major change in source occurred around 14 million years ago, suggesting that based on the remote source location of the debris, permanent ice cover in the Arctic Ocean began at this time. Still other research has shown that the isotopic composition of fluids in the core and bulk sediment, which supports the interpretation that the Transpolar Drift, an ocean current that carries water, ice and sediment from Siberia across the Arctic Sea down the east coast of Greenland, has remained active over the past 15 million years. Other research has examined the possible cause(s) of a long gap in the ACEX record due to a lack of sediment deposition for almost 25 million years Using a multiproxy approach, the research points to the potential of a long time period when the Lomonosov Ridge (a ridge across the floor of the Arctic Ocean) was very shallow, which would have caused limited erosion and non-deposition. Complementing this work, other researchers propose two possible mechanisms for the long-term stalling of ridge subsidence that caused this lengthy shallow setting. Finally, Sluijs and colleagues discovered a second Eocene warming event, the Eocene Thermal Maximum 2, in the ACEX record that occurred 53 million years ago and had brackish and productive surface waters ranging from 15 to 18 degrees Celsius. The ACEX results have transformed our view of the Cenozoic Arctic Ocean and many aspects of the entire paleoclimate system, which helps us to understand how Earth responds to the factors that affect climate. However, the 25-million-year gap that the ACEX record did not include means that we still have much to learn from the Arctic Ocean that may help to explain Earth’s shift from the greenhouse to the icehouse world. Collecting this missing time period is an important goal for future scientific ocean drilling expeditions to the central Arctic Ocean. Moran is an oceanographer at the University of Rhode Island in Narragansett, R.I. Backman is a paleooceanographer at Stockholm University in Sweden. They wish to thank the IODP Expedition 302 Scientific Party.